GAROWE, Somalia August 17, 2014 (Garowe Online)-United Nations Special Representative of Secretary General Ambassador Nicholas Kay is on sixth visit to the northeastern state of Puntland, celebrating first anniversary of United Nations Assistance Mission in Somalia (UNSOM)’s founding day along with UN bodies representatives as well as Puntland government officials in Garowe on Sunday, Garowe Online reports. A delegation led by Ambassador Kay was received by cabinet ministers, parliamentarians and United Nations Assistance Mission in Puntland head Omar Amoud at Garowe International Airport. UN envoy held discussions that centred on Puntland government’s position on ties with Mogadishu-based Federal Government and milestone achievement being made by United Nations in the last 12 months with President Abdiweli Mohamed Ali Gaas. During the bilateral meeting between Puntland leadership and the UN delegation, in attendance were also Vice President Abdihakin Abdullahi Haji Omar Amey and Puntland parliament speaker Saed Hassan Shire. Later today, Ambassador Kay joined his entourage, high-ranking government officials including President Gaas , Vice President Amey, Speaker Shire, cabinet ministers, Federal MPs, traditional leaders, religious figures and other International Community representatives in marking the date on which UN Assistance Mission was established at UNSOM headquarters in the capital, Garowe. “Today I am here not just to celebrate the anniversary of UNSOM in Somalia but I am also here to help you and Mogadishu build a bridge between yourselves,” Kay began with his speech.”Every bridge always needs some maintenance; always there is a chance to fill small holes to make something stronger and I am sure after my discussions today with your president and your parliament I see a way that step-by-step we should strengthen the bridge”. In pursuit of better relations between Puntland and Somalia Federal Government, UN envoy went on: “One thing I am sure of is that Somalia needs Puntland and Puntland needs Somalia. You are the first member state of future federal Somalia and you have a lot to contribute and teach the rest of Somalia”. “You can help the rest of Somalia its process of federating and to find the way in which you also will have your interests protected and respected,” he added. Continuing, UN envoy expressed hope about the future, telling the event participants that together the stakeholders can travel even further in the next few months: “the relationship will be a relationship of mutual benefit, future trust and that Somalia and Puntland will be more united, more united and more peaceful”. Addressing participants at the well organized ceremony marking the founding day of United Nations Assistance Mission in Somalia (UNSOM) from the podium, prominent clan elder Garad Abdullahi Ali Eid has called the recent tripartite agreement which was signed in Mogadishu by Galmudug authorities, local administration of Himan and Heeb and the paramilitary group of Ahlu Sunnah Wal Jamea invalid, calling for amendments. “Federal system was suggested by traditional leaders. 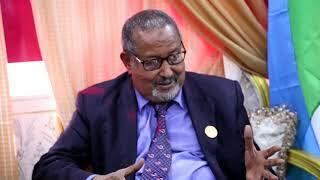 We did so to ensure freedom of movement across Somalia and everything should comply with Federal constitution,” Eid said. “More recently, a map in which Burtinle [Mudug region town near Garowe] was included has been proposed in the presence of Nicholas Kay and his team”. “For example, I am from Sool and Sanaag [disputed regions wedged between Puntland and Somaliland]. Britain created borderlines and we have heard like South Sudan, a referendum will be held for the native residents. 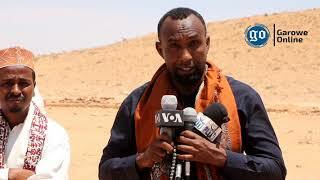 Frankly speaking, on behalf of traditional leaders I am talking to you seriously and we previously made clear to you we are people of Puntland,” unveiled the traditional leader. He acknowledged that challenges are facing his people from Somaliland. Despite suspended ties with Federal Government of Somalia, Puntland leader praised international partners with UNSOM at the forefront for playing a pivotal role in creating an atmosphere of understanding and making sustained focus on Somali issues over the last two decades of civil unrest. 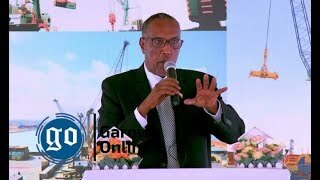 Taking a look back at the reasons that prompted the formation of Somalia’s stable Puntland President Gaas said: “Puntland state was established in 1998 as a federal entity of future united Somalia. The goal of founders was not to split away from the nation but to find a system of governance that will allow the relatively peaceful northeastern region of Somalia to rebuild and move forward out of civil war”. He noted that the chief aim was also to restore the trust that has been lost during the years of bloody stalemate. “The founders were looking for a way to restore the trust that has been lost in the years of war, how could Somalis be learned to trust each other again. 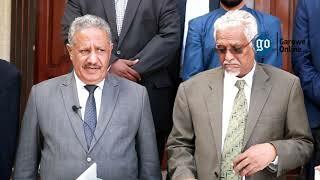 Puntland needs regional autonomy expressed in a federal system [which] will allow Somalia to avoid the mistakes of Siyad Barre Era to never go back to the time of centralized dictatorship”. President Gaas once again reiterated that Puntland government played enthusiastic role between 2011 and 2012 to facilitate roadmap process and the creation of current 275-seat-chamber of parliament. 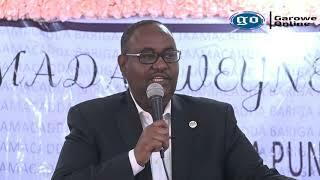 Concluding Puntland President said, he is hopeful that Mogadishu-based federal government will lead the way in completing the constitution and sharing rights and responsibilities between the center and the state. UN cooperates with central government in Mogadishu, Puntland and Somaliland’s separatist administration on political and security fronts by also giving support to rule of law institutions such as police.